Hat - Cap - Neckerchief There are 8 products. 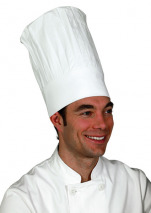 White Chef's hat, 100% cotton adjustable by 8 cm velcro (one size), head band of 9 cm and total height : 36 cm. 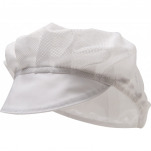 White food cap, mixed, ventilated mesh and elastic, with visor, 65% polyester and 35% cotton. One size. 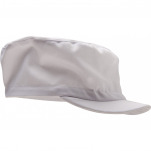 Food white cap, rigid peak, 65% polyester and 35% cotton, one size, Unisex cap, 200 gr/m². Black flat cap adjustable by velcro, one size, 65% polyester and 35% cotton, height 8 cm. 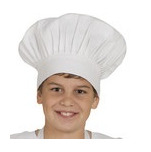 Falling Toque for child and adolescent, 100% white cotton with velcro. Height 25 cm, comprising a strip of 6.5 cm. 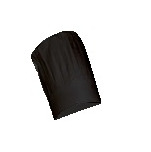 Black Chef's hat, 100% cotton adjustable by 8 cm velcro (one size), head band of 9 cm and total height : 36 cm. 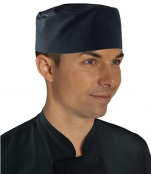 Food black cap, rigid peak, 65% polyester and 35% cotton, one size, Unisex cap, 200 gr/m². Falling Toque for child and adolescent, polycotton 65/35 with velcro. Height 22 cm, comprising a strip of 4 cm. Available in white, fuchsia and turquoise. Washable at 60°C.